Knowledge of how synapses alter their efficiency of communication is central to the understanding of learning and memory. The most extensively studied forms of synaptic plasticity are long-term potentiation (LTP) and its counterpart long-term depression (LTD) of AMPA receptor-mediated synaptic transmission. 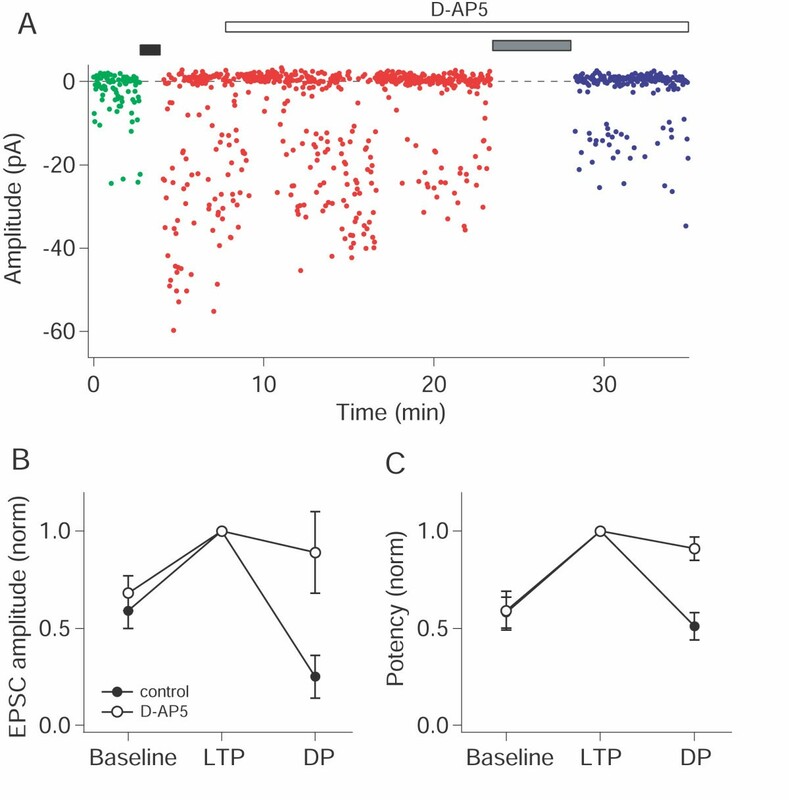 In the CA1 region of the hippocampus, it has been shown that LTP often involves a rapid increase in the unitary conductance of AMPA receptor channels. However, LTP can also occur in the absence of any alteration in AMPA receptor unitary conductance. In the present study we have used whole-cell dendritic recording, failures analysis and non-stationary fluctuation analysis to investigate the mechanism of depotentiation of LTP. We find that when LTP involves an increase in unitary conductance, subsequent depotentiation invariably involves the return of unitary conductance to pre-LTP values. In contrast, when LTP does not involve a change in unitary conductance then depotentiation also occurs in the absence of any change in unitary conductance, indicating a reduction in the number of activated receptors as the most likely mechanism. These data show that unitary conductance can be bi-directionally modified by synaptic activity. Furthermore, there are at least two distinct mechanisms to restore synaptic strength from a potentiated state, which depend upon the mechanism of the previous potentiation. Fast excitatory synaptic transmission in the central nervous system, which is mediated predominantly by the AMPA subtype of glutamate receptors, can undergo long-term bi-directional modifications in strength [1–3]. These persistent changes have been proposed to be key synaptic processes involved in learning and memory. The best characterised form of bi-directional synaptic plasticity is LTP / LTD of glutamatergic transmission in the CA1 region of the hippocampus. Although there has been intensive investigation of the induction and expression of LTP and LTD (see ), the precise molecular mechanisms by which these alterations in synaptic strength occur remain unclear. Possible mechanisms could be presynaptic such as changes in the release process (probability of neurotransmitter release or the amount of L-glutamate released from vesicles (e.g., [5–9]), and / or postsynaptic (e.g., [10–12]), such as a change in the number of AMPA receptors (AMPARs) available to bind transmitter, or in the properties of existing receptors (Popen, activation or de-activation kinetics, desensitisation or single-channel conductance, γ). Recent studies have provided information on the possible mechanisms underlying postsynaptic alterations in synaptic strength. There is evidence that AMPA receptors are inserted into the postsynaptic membrane during LTP [13–15] and removed from the synapse upon induction of LTD [16, 17]. However, it has also been shown that LTP can involve a rapid increase in γ of existing AMPA receptors . This could be caused by a Ca2+/calmodulin-kinase II (CaM-KII)-mediated phosphorylation of GluR1 which occurs during LTP , and which causes an increase in γ of GluR1 homomers in transfected cells . Therefore, another potential mechanism for LTD could be a decrease in γ caused by a dephosphorylation of AMPARs. We have recently used peak-scaled non-stationary fluctuation analysis (non-SFA; ) of synaptic currents recorded from CA1 pyramidal cell dendrites , to investigate the molecular basis of de novo LTD (LTD at naïve pathways; [22, 23]). In these studies, LTD was never associated with a change in γ . Indeed, evidence was presented that the underlying mechanism involved a reduction in the number of surface expressed AMPA receptors (LTDN). In the present study we have investigated a second form of LTD known as depotentiation (DP), which is a reversal of pre-established LTP [24–27]. LTP can be associated with either an increase in γ (LTPγ) or no change in γ (LTPN) . We were, therefore, interested to determine whether DP of LTPγ involved a decrease in γ and hence whether γ is a bi-directionally modifiable parameter. We find a reciprocal relationship between LTP and DP, such that DP of LTPγ invariably involves a restoration of the pre-LTP γ (DPγ) whereas DP of LTPN never involves a change in γ (DPN). These data show, firstly, that there are two distinct molecular mechanisms for the reduction of synaptic strength that are dependent on the nature of the preceding LTP and, secondly, that γ can indeed be bi-directionally modified in response to synaptic activity. Using whole-cell recordings from the proximal apical dendrites of hippocampal CA1 pyramidal cells, minimal stimulation of nearby afferents evoked EPSCs that could be reliably resolved from failures (trials in which stimulation produced no synaptic response; Figure 1, see also Figure 3). These high resolution recordings enabled both a failures analysis to be performed  and, using non-SFA, an estimate of γ of synaptically-activated AMPARs to be obtained . Bi-directional modification of AMPA receptor conductance (γ) during LTP (LTPγ) and DP (DPγ). (A1,2) Plot of amplitude vs. time from two representative experiments. Black bar represents LTP pairing, grey bar DP pairing protocol. Throughout the figure, green represents baseline, red LTP and blue DP. (B1,2) Current-variance relationship for baseline, LTP and DP (γ values for the same cells (pS): cell 1:baseline = 2.2, LTP = 6.5, DP = 3.7; cell 2: baseline = 4.5, LTP = 7.4, DP = 3.2). For this figure and in Figure 3, lines are parabolic fits of the data (see Methods). (C1,2) Inset. Mean EPSCs (average of all responses used for non-SFA) superimposed (left) and peak scaled (right). Amplitude histograms (bin width = 2 pA; number of trials: cell 1: N = 130 for baseline, N = 245 for LTP, N = 533 for DP; cell 2: N = 150 for baseline, N = 267 for LTP, N = 337 for DP; frequency normalised to the data set with the smallest number of observations for baseline, LTP and DP). DP can occur without alterations in γ (DPN) but only when preceded by LTP that does not involve a change in γ (LTPN). (A) Plot of amplitude vs. time from a representative experiment. Black bar represents LTP pairing, grey bar DP pairing protocol. Throughout the figure, green represents baseline, red LTP and blue DP. (B) Current-variance relationship for baseline, LTP and DP (γ values for this cell (pS): baseline = 6.5, LTP = 6.7, DP = 6.0). (C) Mean EPSCs (average of all responses used for non-SFA) superimposed (left) and peak scaled (right). (D) Amplitude histogram (bin width = 2 pA; N = 151 for baseline, N = 211 for LTP, N = 513 for DP) for baseline, LTP and DP. Inset: 10 consecutive responses for baseline, LTP and DP. 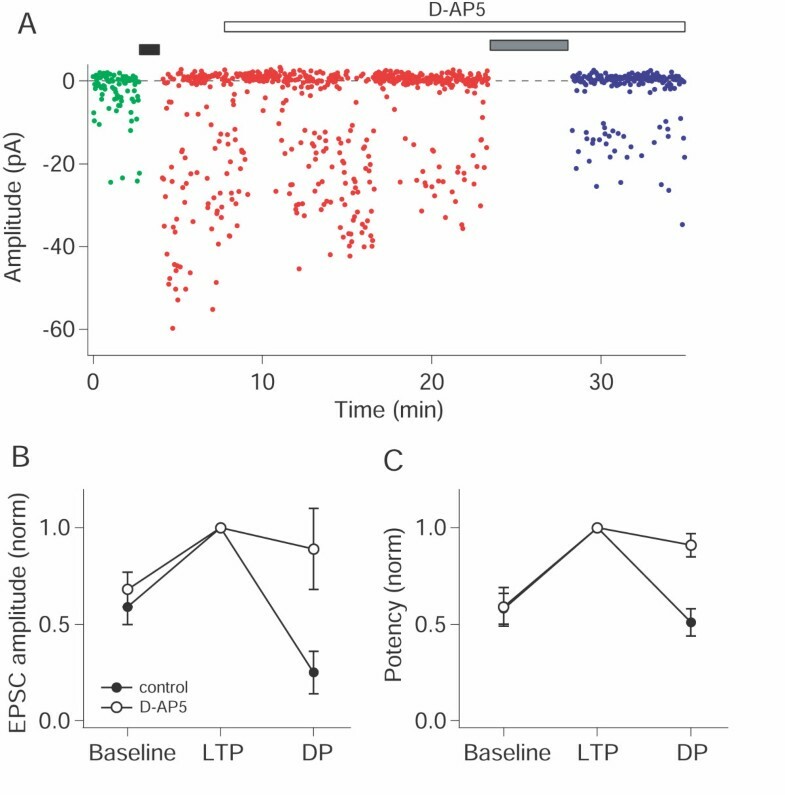 To investigate the mechanism of DP, LTP was first induced in 18 cells by pairing afferent stimulation (baseline frequency) with a holding potential of 0 mV. This resulted in stable LTP (EPSC amplitude = 186 ± 16 % of baseline, n = 18). In agreement with a previous study , cells fell into two groups with respect to changes (> 20%) in γ of AMPA receptor channels during LTP. In the majority of cases (11/18 cells), LTP was associated with an increase in γ (LTPγ; 246 ± 26% of baseline; range 136 – 363%). In the other 7 cells there was no increase in γ during LTP (100 ± 4 % of baseline; range 85 – 118 %), indicating that there was an increase in the functional number of channels activated (LTPN). 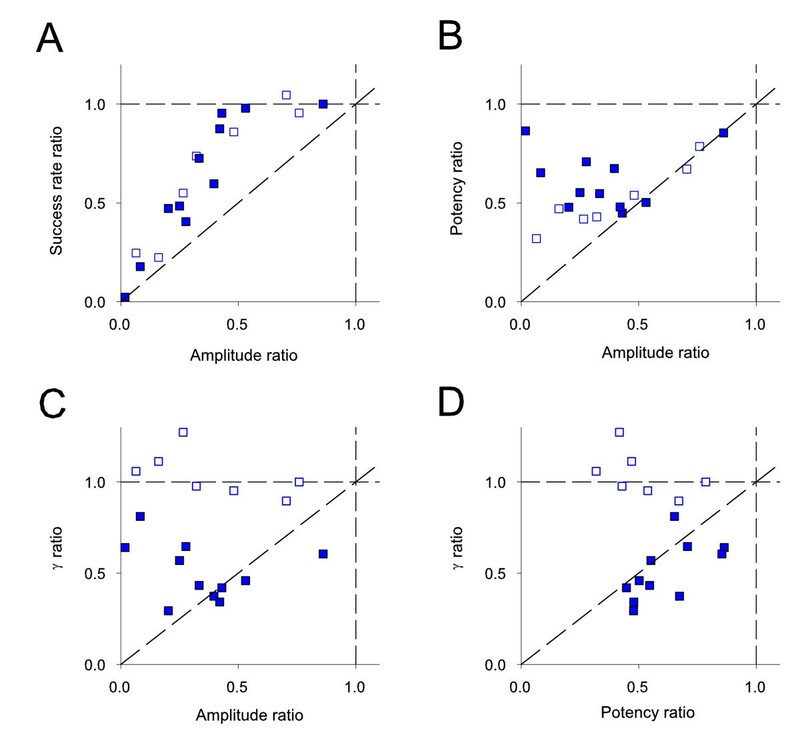 As noted previously , there were no differences between the two groups of neurons with respect to a variety of baseline parameters. Figure 1 shows two examples from the group of cells that exhibited LTPγ, as indicated by the change in the current-variance plot obtained from non-SFA (Figure 1B). 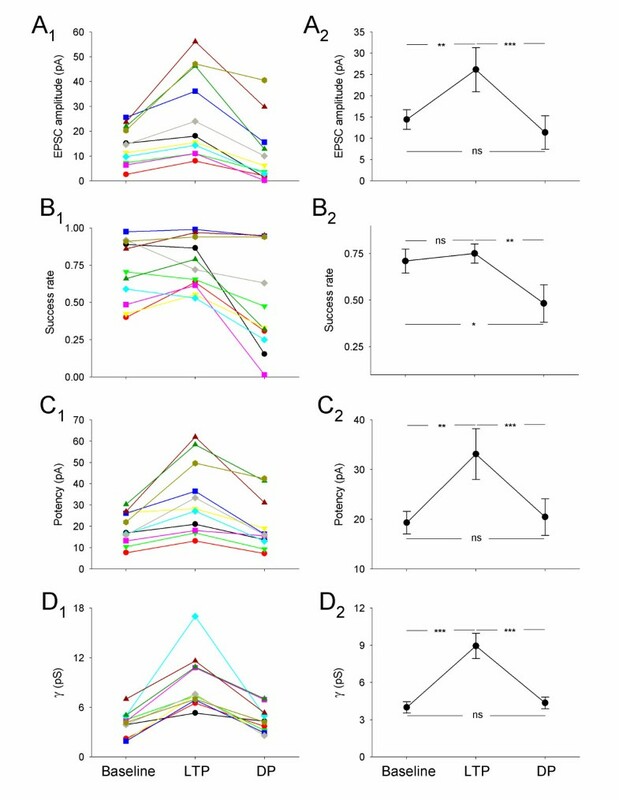 As previously reported , the increase in γ was not associated with any change in EPSC kinetics (Figure 1C) indicating that AMPA receptor channel kinetics were not affected . Failures analysis (Figure 1C) of this group of cells (Figure 2) revealed that LTP was associated with changes in success rate (1 – failure rate) in some cells (Figure 2B), and potency (mean EPSC amplitude excluding failures) in all cells (Figure 2C), as previously reported under these recording conditions [18, 28]. Summary data for all cells that exhibited DPγ. (A) Changes in mean EPSC amplitude for (A1) individual experiments, and (A2) pooled data. (B – D) Similar plots for (B1 & B2) success rate (1 – failure rate), (C1 & C2) potency and (D1 & D2) γ. In this, and Figure 4, ns = not significant, * P < 0.05, ** P < 0.01, *** P < 0.001). For this group of cells, DP, induced by pairing stimulation (baseline frequency) with a holding potential of -40 mV, always resulted in a reversal of the γ increase, as indicated by the current-variance plot (Figure 1B; Figure 2D). Similar to the preceding LTPγ, this form of DP (DPγ) was also associated with no change in EPSC kinetics (τrise: baseline = 1.6 ± 0.2 ms, LTPγ = 1.7 ± 0.3 ms, DPγ = 1.7 ± 0.2 ms, n = 11; τdecay: baseline = 8.3 ± 0.6 ms, LTPγ = 8.2 ± 0.6 ms, DPγ = 8.9 ± 0.7, n = 11; Figure 1C). Failures analysis showed that DPγ was associated with a decrease in success rate in most cells (Figure 2B) and a full reversal of the potency increase (Figure 2C). These data show that the primary mechanism for DP is the reversal of any increase in γ caused by LTP. Indeed, the changes in γ were sufficient to account for the potency changes during both LTPγ and DPγ. (In most cells the alterations in γ actually exceeded the potency changes. This is most likely due to an underestimate of the potency change due to dendritic filtering, which affects measurements at the peak of EPSCs greater than during the tail, from where the non-SFA estimates are obtained; see ). Figure 3 shows an example from the group of cells that exhibited no change in γ during LTP (LTPN), as indicated by the current-variance plot (Figure 3B). The change in EPSC amplitude for LTPN neurons (Figure 4A) was similar to that for LTPγ neurons (Figure 2A). Failures analysis (Figure 3D) of this group of cells (Figure 4) revealed that LTP was associated with changes in success rate in some cells (Figure 4B), and potency in most cells (Figure 4C; P < 0.01), as previously reported under these recording conditions [18, 28]. Summary data for all cells exhibiting DPN. (A) Changes in mean EPSC amplitude for (A1) individual experiments, and (A2) pooled data. (B – D) Similar plots for (B1 & B2) success rate, (C1 & C2) potency and (D1 & D2) γ. In contrast to DPγ, DP in these cells was never associated with a change in γ (DPN; Figure 3B, Figure 4D). There was also no change in EPSC kinetics with LTP or DP (τrise: baseline = 1.9 ± 0.4 ms, LTPN = 2.0 ± 0.3 ms, DPN = 1.8 ± 0.3 ms, n = 7; τdecay: baseline = 9.7 ± 0.7 ms, LTPN = 9.7 ± 0.6 ms, DPN = 10.1 ± 0.9, n = 7; Figure 3C). Failures analysis of LTPN and DPN (Figure 3D, Figure 4) showed similar changes to the LTPγ group of cells in EPSC amplitude (Figure 4A), success rate (Figure 4B) and potency (Figure 4C). These data suggest that there is a second mechanism for DP, not involving a decrease in γ, which co-exists at CA1 synapses. Therefore, there are two mechanisms for the expression of DP that depend upon the expression mechanism of the previous potentiation. It has been shown previously that DP at CA1 synapses may be blocked either by NMDA receptor antagonists  or by mGlu receptor antagonists  and that this may depend on previous history . In the present study we wished to focus on NMDA receptor-dependent synaptic plasticity and therefore used pairing protocols designed to activate NMDA receptors sufficiently to, firstly, induce NMDA receptor-dependent LTP and, secondly, to induce NMDA receptor-dependent DP. To verify that we were indeed investigating NMDA receptor-dependent DP we performed a series of experiments using the NMDA receptor antagonist D-AP5 interleaved with control experiments. Following the induction of LTP, D-AP5 (50 μM) was bath applied for 15 minutes before delivering the DP induction stimulus. Whilst DP was induced in the control experiments (25 ± 11% of baseline, n = 5; p < 0.05) it was blocked by D-AP5 (89 ± 21%, n = 4; Figure 5). NMDA receptor-dependence of DP. (A) Plot of amplitude vs. time from an experiment in which the DP induction protocol was delivered in the presence of D-AP5 (50 μM). Black bar represents LTP pairing, grey bar DP pairing protocol. (B) Changes in mean EPSC amplitude for normalised pooled data. Filled symbols: control (n = 5); open symbols: D-AP5 (n = 4). (C) Changes in potency for normalised pooled data (symbols as in B). For the analysis of LTP, amplitude and potency were measured for the 200 trials immediately preceding the DP pairing protocol. 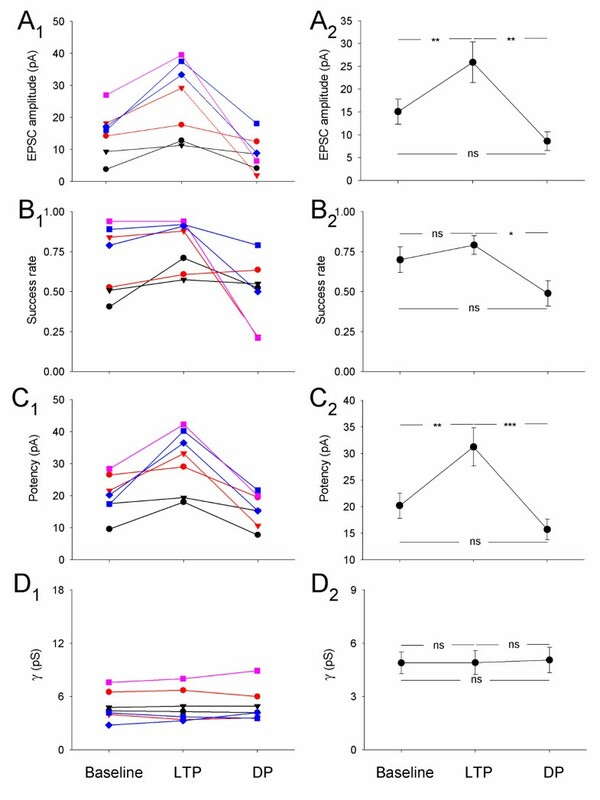 To gain further insights into the underlying mechanisms of DP we compared changes in EPSC amplitude, success rate, potency and γ for the individual experiments (Figure 6). A decrease in success rate indicates a reduction in probability of transmitter release (Pr) and/or a reduction in the number of functional synapses (n). A decrease in potency indicates a reduction in quantal amplitude (postsynaptic response to the release of a single quantum of transmitter, q) or, if multiple synapses are activated, a reduction in Pr or n.
Further analysis of DP experiments. (A) Success rate ratio (DP / preceding LTP) vs. amplitude ratio for individual DP experiments (open symbols represent experiments for which γ did not change, closed symbols for experiments in which there was a change in γ). These symbol codes apply to the rest of the figure. (B) Potency ratio vs. amplitude ratio. (C) γ ratio vs. amplitude ratio. (D) γ ratio vs. potency ratio. In both types of neuron (i.e., LTPγ and LTPN), a small depression of less than 50 % (to 71 ± 7% of baseline; n = 4) was associated with no change in success rate (Figure 6A; success rate ratio = 1.00 ± 0.01) but an equivalent decrease in potency (Figure 6B; potency ratio = 0.70 ± 0.08), as is also observed for de novo LTD ). This indicates that the depression in these cells was associated primarily with a decrease in q. For larger depressions (to 26 ± 4 % of baseline; n = 14) there was also a marked decrease in success rate (success rate ratio = 0.52 ± 0.08; P < 0.01 vs success rate ratio for the group with DP < 50%) as well as a decrease in potency (potency ratio = 0.54 ± 0.04). This suggests that in these cells there was an additional decrease in Pr or n. Therefore, for DPγ, the change in γ did not fully account for the amplitude change in every cell (Figure 6C) but did account for the potency change (Figure 6D). In this study we have shown that there are two mechanisms for NMDA receptor-dependent DP, a reduction in γ (DPγ) and a decrease in the number of activated AMPA receptors (DPN). As reported previously for different data sets from this age of rats [9, 18] there are two forms of LTP; in approximately two-thirds of neurons LTP was associated with an increase in γ (LTPγ) whilst in the remainder there was no change in γ (LTPN). In the present study we saw a similar proportion of LTP expressed by changes in γ versus N. Strikingly, we observed a precise relationship between the mechanism of DP and the form of preceding LTP; LTPγ was always reversed by DPγ, and LTPN was always reversed by DPN. In some experiments, induction of DP caused a decrease in EPSC amplitude below the initial baseline. This is most likely due to the simultaneous induction of DP and de novo LTD since in slices taken from juvenile animals, de novo LTD is readily induced by this  and other [22, 23] induction protocols. This is in contrast to previous experiments using adult tissue in which DP induction depressed synaptic responses only as far as the initial baseline and where the same induction protocol was unable to induce de novo LTD . Analysis of the mechanism of de novo LTD under the present experimental conditions demonstrated that it was associated with no change in γ . Therefore the coexistence of DP and de novo LTD does not interfere with the analysis of DPγ. In addition, there is sometimes a small, gradual run-down of synaptic responses observed in minimal stimulation experiments using two-week-old animals  see also . Whilst this effect tends to exaggerate changes in amplitude and success rate during DP in some neurons, it does not significantly interfere with estimates of potency or γ (see ). What might be the mechanism underlying DP that is not associated with a decrease in γ (i.e., DPN)? It is unlikely that this type of depression is due to a change in channel kinetics because there was no change in EPSC kinetics (see [18, 29]). Therefore the mechanism is most likely a reduction in the number of activated AMPARs. This could be due to a presynaptic mechanism such as a reduction in release probability, the L-glutamate content of vesicles or the amount of L-glutamate discharged during fusion. Indeed there is evidence that some forms of LTD are expressed presynaptically [5, 35]. Postsynaptic mechanisms for a reduction in the number of activated AMPA receptors include a reduction in their Popen or in the physical number of receptors present in the postsynaptic membrane . The present observations for DPN are indistinguishable from those that we and others have reported recently for de novo LTD [17, 38]. For example, we showed that similar effects were obtained using the postsynaptic injection of a peptide (pep2m) that disrupts the interaction between NSF and GluR2 [39–42]. The effects of pep2m and those of de novo LTD were mutually occlusive, indicating a convergence of mechanisms. These data argue strongly for a postsynaptic mechanism of expression. Furthermore, since pep2m causes the removal of AMPA receptors from the membrane surface, as determined immunocytochemically [38, 42], it is most likely that de novo LTD is due to the physical elimination of synaptic AMPA receptors. Other evidence for a postsynaptic mechanism for de novo LTD includes a reduction in the postsynaptic sensitivity to glutamate [43, 44], the dephosphorylation of serine 845 of the GluR1 subunit [45, 46] and a rapid internalisation of AMPA receptors  associated with LTD. Therefore, by analogy, we feel that the postsynaptic removal of AMPA receptors is also the most likely explanation for DPN (Figure 7A). Accordingly, a reduction in AMPA receptor number would account for the changes in potency without changes in success rate observed with modest DPN. The removal of an entire synaptic complement of AMPA receptors would explain the additional change in success rate seen with large depressions associated with DPN in some cells. A model for the mechanisms of DP and de novo LTD. Rectangles represent AMPARs, open circles transmitter vesicles. (A) DP is due to a reduction in the number of surface-expressed AMPARs (DPN) when preceded by LTPN. 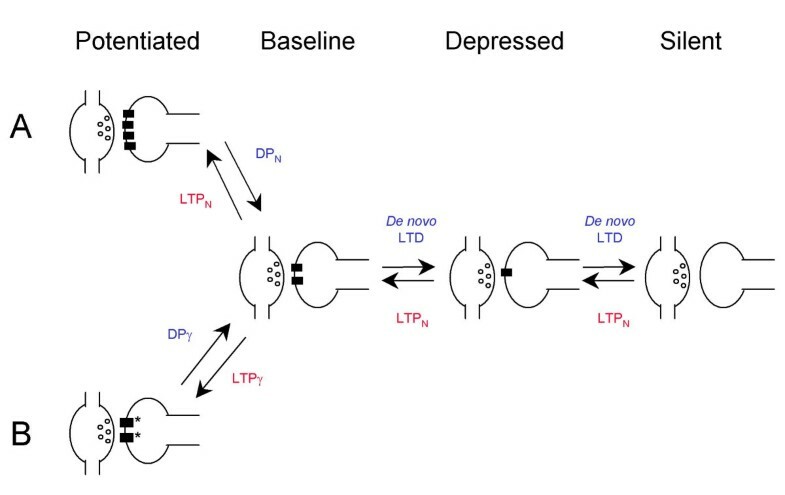 Depression below the original baseline is due to a further reduction in AMPA receptor number causing a complete loss of postsynaptic receptors at some synapses. De novo LTD  is due to the same mechanism. (B) DP is due to a reduction in γ (DPγ) when preceded by LTPγ. A number of possible underlying mechanisms could account for the change in γ during LTPγ and DPγ. Non-SFA cannot distinguish between 1) a change from a single low conductance state to a single high conductance state, 2) changes in open times within a burst and, 3) changes in the proportion of time spent in different conductance states. Since AMPA receptors are known to have multiple conductance states [32, 33] we have postulated that the proportion of time spent in different conductance states is the modifiable parameter . Such a change is detectable with the type of analysis that we have used, which provides a weighted mean of the various sub-conductance states . 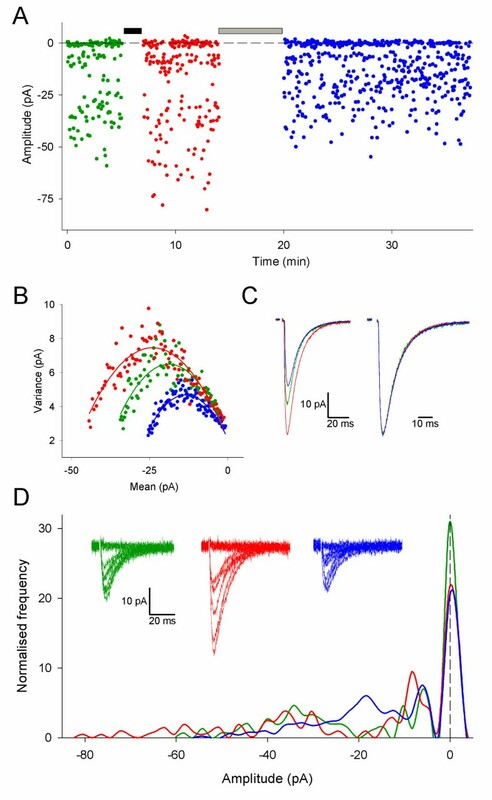 Independent support for this hypothesis is provided by a study which shows that phosphorylation of GluR1 at serine 831 increases the proportion of time AMPA receptors spend in high conductance states, as determined by single channel recording . Indeed, phosphorylation of this residue occurs during LTP . Thus a possible mechanism of DPγ is the dephosphorylation of serine 831 , perhaps involving calcineurin , resulting in a lower proportion of time AMPA receptors spend in the higher conductance states (Figure 7B). Other theoretical possibilities exist to explain DPγ. For example, the silencing of synapses close to the patch electrode leaving more distant synapses contributing a lower net γ due to electrotonic filtering, or a decrease in trial-to-trial asynchrony of transmitter release. We believe that these possibilities are unlikely because in every cell in which de novo LTD was induced there was never a change in γ . If such possibilities were likely, statistically one would expect similar changes to occur for both de novo LTD and DP. Moreover, we have also investigated these possibilities using our standard compartmental model . This shows that 1) the electrotonic filtering required to achieve an artefactual decrease in γ would have a pronounced effect on τdecay which was never observed experimentally, and 2) pronounced changes in asynchrony necessary to cause an artefactual change in γ cause large deviations from the parabolic relationship in the current-variance plot (unpublished observations) and alterations in τrise , also never observed experimentally. Another possibility is that alterations in vesicle fusion pore dynamics leading to substantial changes in the peak and time-course of cleft glutamate are caused by synaptic plasticity . Such changes could differentially affect estimates of γ , however they would be associated with substantial changes in τrise and τdecay , which were never observed experimentally. In summary, we have shown that there are two distinct molecular mechanisms for the reduction of synaptic strength. Although previous studies have provided evidence that LTD is associated with dephosphorylation of serine 845 on GluR1  and internalisation of AMPA receptors [16, 17] it is not known whether this represents two separate mechanisms or two components of the same process. For example, dephosphorylation of GluR1 could drive the internalisation of AMPA receptors. Here we show, for the first time, the co-existence of two distinct mechanisms for the expression of DP, using functional criteria under identical experimental conditions. The relationship between the two mechanisms is critically dependent upon the recent experience of the synapse, which may be governed by the phosphorylation state of the AMPA receptor complement . Further work is now required to elucidate the relationship between these two fundamental mechanisms for modulating synaptic strength and the precise molecular mechanisms involved in each form of plasticity. Hippocampal slices (400 μm) were obtained from 12–15 day old rats and perfused with an extracellular solution containing (in mM): 124 NaCl, 3 KCl, 1.25 NaHPO4, 26 NaHCO3, 2 CaCl2, 1 MgSO4, 15 glucose, 2 ascorbic acid, 0.05 picrotoxin, saturated with 95% O2 / 5% CO2, at room temperature (23–25°C). Individual dendrites were visualised using infrared illumination and DIC optics and approached under visual control. Whole-cell dendritic recordings of synaptic currents were obtained at a holding potential of -70 mV using patch electrodes (6–10 MΩ) filled with a solution containing (in mM): 135 CsMeSO4, 8 NaCl, 10 HEPES, 0.5 EGTA, 4 Mg-ATP, 0.3 Na-GTP, 5 QX-314, pH 7.25, 285 mOsm. Schaffer collateral-commissural fibers were stimulated at 0.5 Hz using a platinum monopolar or concentric bipolar electrode, which was positioned 20–40 μm from the dendrite parallel to the input pathway. The stimulus intensity was set to evoke some failures to enable a failures analysis to be performed and to ensure that the majority of EPSCs were, for any given trial, evoked by release from a single site. However, to elicit sufficient EPSCs to obtain a baseline estimate of γ before "washout" of LTP it was usually necessary to set the success rate fairly high (usually above 50%). As a result it is likely that multiple release sites contributed to the recordings. LTP was induced by pairing 40–60 stimuli (baseline frequency) with a holding potential of 0 mV. DP was induced following the induction of stable LTP by 100–200 stimuli (baseline frequency) at -40 mV holding potential. All recordings were made using an Axopatch 1B amplifier, signals were filtered at 5 kHz (8 pole Bessel filter), digitised at 10 kHz and stored on computer. EPSC amplitude and input resistance were analysed and displayed on-line using the 'LTP' program ). Series resistance was estimated by measuring the peak amplitude of the fast whole-cell capacitance current in response to a -1 mV step applied to the cell during each sweep. The amplitude was estimated by fitting the capacitance transient with a double exponential (from 0.5 ms after the peak) and determining the current at the beginning of the step. Series resistance was stable throughout recordings (series resistance values [MΩ]: baseline = 42 ± 3, LTP = 40 ± 3, DP = 43 ± 3, n = 17). Non-SFA was performed as described previously . Briefly, synaptic currents were aligned by their point of maximal rise, and averaged. The average response waveform was scaled to the peak, subtracted from individual responses and the variance of the decays calculated. The variance was plotted vs. the mean current amplitude and the single channel current was estimated by fitting the data to: σ2 = iI - I2/N + bl, where σ2 is the variance, I is the mean current, N is the number of channels activated at the peak, i is the single channel current and bl is the background variance. The single channel conductance (γ) is then γ = i/V, where V is the driving force (holding potential – assumed reversal potential of 0 mV). Response amplitude was measured in two ways. For failures, amplitude was estimated by measuring the difference between the average current over two time windows of equal length, one immediately before the stimulus artefact and the other centred on the peak of the mean EPSC. For estimation of the amplitude of successes the peak amplitude over a set time window was determined. Failures were identified visually, and potency was calculated as the mean EPSC amplitude excluding failures. For analysis of EPSC kinetics, rise time was estimated by the time-constant of a single exponential fit of the rising phase of the mean EPSC waveform. For decay, the time-constant of the single exponential fit to the decay phase was used. For display of individual EPSC traces in the figures, the stimulus artefact was digitally subtracted using an average of identified failures. All histograms are represented as smoothed line plots (SigmaPlot ver 5.0). Data are expressed as % of baseline (i.e., 100 % = no change). Statistical significance was assessed using the Student's t-test (one or two-tailed, paired or unpaired as appropriate; P < 0.05 as significant). All values are expressed as mean ± s.e.m. This work was supported by the MRC (G.L.C. ), BBSRC (P.M.), NIH (T.A.B. ), the Swiss National Science Foundation (A.L. ), and The Wellcome Trust (J.T.R.I). M.A.W was a research fellow supported by the Swedish Foundation for International Cooperation in Research and Higher Education. AL performed most of the electrophysiology. MJP and MAW also contributed some recordings. PM provided some information that guided the work. TB performed the modelling that provided the theoretical frame-work. JI helped with the design and analysis of experiments. GLC coordinated the work and contributed to its design. All authors read and approved the manuscript.